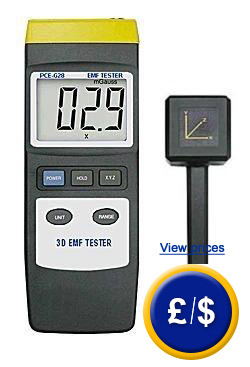 The PCE-G28 radiation detector for magnetic fields comes with a triaxle sensor to determine electro-magnetic radiation. The radiation detector has been specially designed to measure transformers and for evaluating magnetic fields generated by computer monitors, industrial electrical installations and electro-motors. The radiation detector meets such European standards as: the European Union Electromagnetic Compatibility Directive IEC 801-1 (EN 50081-1), such as for laboratory prescriptions and measuring instruments IEC 204 (EN 60204). By way of a triaxle sensor, it can save conversions for each axis. This small gaussmeter for electrical fields has some characteristics which are useful in an industrial setting. It is easy to use and very accurate. Here you will find an overview of all the radiation detectors we have available to meet your needs. Electro magnetic fileds are produced when electrical equipment or devices are used. They can have a huge influence on the human body depending on their frequency. The consequences can be a simple discomfort, a nervous excitement or more seriously, internal burns. As such, it is necessary to determine the risk to workers exposed to electromagnetic fields and to apply health and safetly standards for industries. The first area of exposure includes all controlled areas, such as industrial electrical workshops and areas controlled by a company. It also includes areas of general access where there is a brief exposure due to the way the installation is setup. This brief exposure equates to a work shift. The safety charge can determine the electro.magnetic radiation in Gauss or in Tesla and classified with the help of the device. With an technical frequency of energy of "f" = 50Hz in the first area of exposure the limit is considered to be 1.36µT, and in area 2 the value is 0.42µT. YOu will find more information on this sunject here. computer monitor. electro magnetic fields of power lines. -ISO calibration certificate for companies that desire to incorporate the device into their testing equipment or for an annual recalibration. 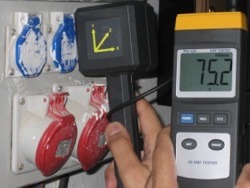 The ISO certification includes a laboratory calibration with a control document containing all the calibration data. Note: The factory ISO calibration included with the order can only be used with the corresponding sensors.